One of my favorite things about summer is all of the fresh fruit that’s readily available. I’m not the best when it comes to eating a healthy amount of fruits and vegetables, but at least I’ve always liked fruit. It’s a much greater struggle with me and vegetables; we’ve never seen eye-to-eye, and it’s something I really need to work on. In the mean time, however, I love taking advantage of the produce that summer brings. Blueberries, raspberries, blackberries, strawberries, watermelon, cantaloupe, honeydew, and the list goes on and on… They’re such a welcome change of pace from the same old bananas and apples that I’ve been eating all winter long. 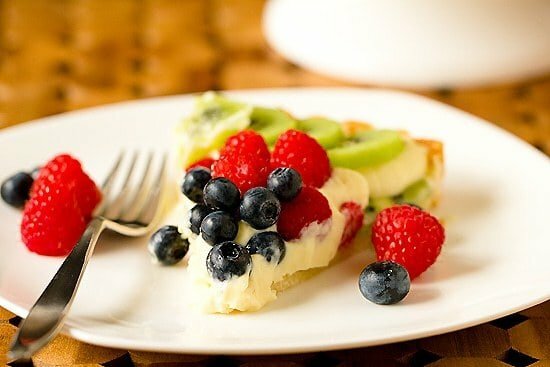 Aside from fruit salads, snacks on sweltering summer days and mixed into cottage cheese for breakfast, I love using fresh fruit in desserts whenever I can once summer hits. They add an enormous punch of flavor to any baked good and usually leave them feeling just light enough to satisfy but not weigh you down. This tart is a fabulous way to use up your favorite fruit of the season. 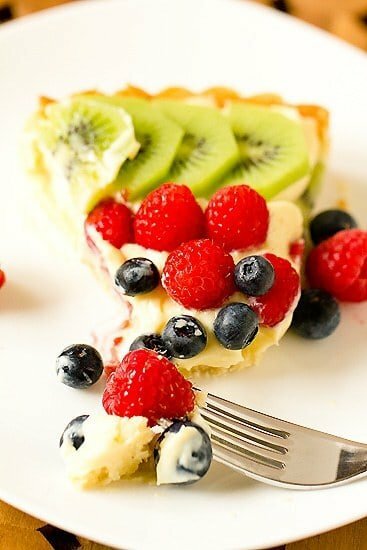 A sweet pastry dough is baked in a tart pan, filled with pastry cream and then topped with kiwi, raspberries, and blueberries. It’s cool, creamy and packed with fruit. The perfect end to a delicious summer meal. (1) You can make each of the components ahead of time, so you don’t need to worry about fussing around right before you want to serve this. The dough for the crust can be mixed and refrigerated for up to 2 days. The pastry cream can be made and refrigerated for up to 3 days. 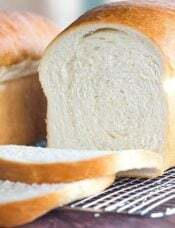 You can easily bake the crust early in the day you plan to serve it. 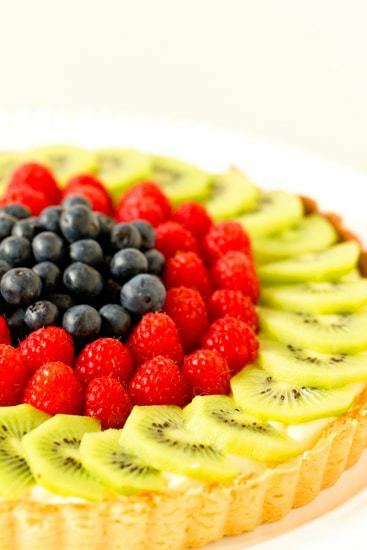 Once the crust is baked and cooled, fill it with the pastry cream and top with the fruit before guests arrive. Pop it in the refrigerator while you enjoy dinner! (2) This recipe is easily adaptable to whatever your favorite fruits of the season are. You could make a mixed berry tart, using raspberries, blueberries, and blackberries. You could go all-strawberry. You could even use sliced peaches, apricots or nectarines. Whatever you like, throw it on top! (3) It’s delicious, and there are copious amounts of pastry cream, which I could easily eat straight from the bowl with a spoon. What would be your topping of choice for this tart?? 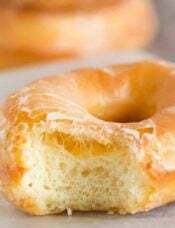 Make the Pastry Cream: Heat the half-and-half, 6 tablespoons of the sugar, and the salt in a medium heavy-bottomed saucepan over medium heat until simmering, stirring occasionally to dissolve the sugar. When the half-and-half mixture reaches a full simmer, gradually whisk the simmering half-and-half into the yolk mixture to temper. Return the mixture to the saucepan, scraping the bowl with a rubber spatula; return to a simmer over medium heat, whisking constantly, until a few bubbles burst on the surface and the mixture is thickened and glossy, about 30 seconds. Off the heat, whisk in the butter and vanilla. Strain the pastry cream through a fine-mesh sieve set over a medium bowl. Press plastic wrap directly on the surface to prevent a skin from forming and refrigerate until cold and set, at least 3 hours or up to 2 days. 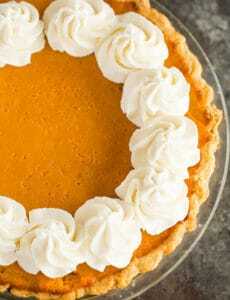 Make the Crust: Whisk together the yolk, cream and vanilla in a small bow; set aside. Place the flour, sugar and salt in a food processor and process briefly to combine. Scatter the butter pieces over the flour mixture; process to cut the butter until the mixture resembles coarse meal, about fifteen 1-second pulses. With the machine running, add the egg mixture and process until the dough just comes together, about 12 seconds. Turn the dough onto a sheet of plastic wrap and press into a 6-inch disk. 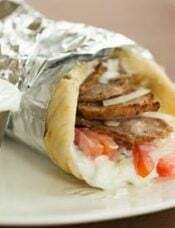 Wrap in plastic and refrigerate at least 1 hour or up to 48 hours. Preheat oven to 375 degrees F. Set the dough-lined tart pan on a baking sheet, press a square of foil into the frozen tart shell and over the edge, and fill with metal or ceramic pie weights. Bake for 30 minutes, rotating halfway through the baking time. Remove from the oven and carefully remove the foil and weights. Continue to bake until deep golden brown, 5 to 8 minutes longer. Set the baking sheet with the tart shell on a wire rack and cool to room temperature. Assemble the Tart: Spread the cold pastry cream over the bottom of the tart shell, using an offset spatula or large spoon. 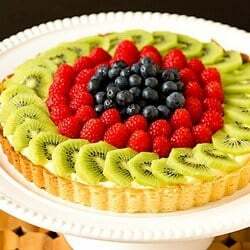 Arrange the kiwi slices in an overlapping circle around the inside edge of the pastry. Arrange the raspberries in rings just inside the kiwi. Mound the blueberries in the center. (The tart can be refrigerated, uncovered, up to 30 minutes.) 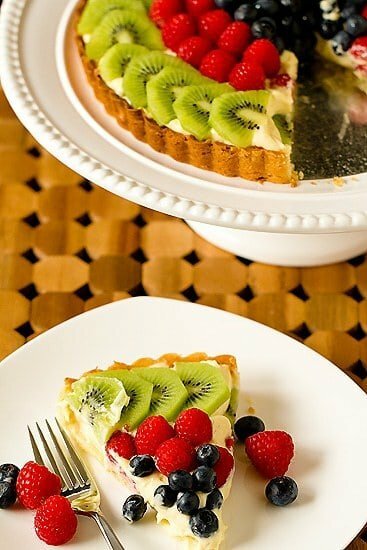 Remove the outer ring of the tart pan and place the tart onto a serving platter; serve. When you are cooking the cream on the stovetop, does it bubble? I don’t know if I am overcoming it.. I took it off the stove but it seems very thick.. and doesn’t feel creamy but more like gelatin ?? If that makes sense.. I am not sure if that means I overcooked it..
what if anything would you put on the fruit to make them shiny? You could water down some honey and brush that on! 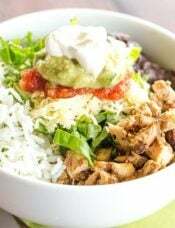 I have been a huge fan of your site & usually any recipe I’ve tired before has been a huge success. This one is challenging and I don’t know what I’m doing wrong. I followed your recipe – twice. the dough was like powder & wouldn’t come together. After the second time – I looked at the comments to see if anyone else had problems with the crust. You mention in one of them to add the ice water – but I re-read your instructions and you don’t mention ice water anywhere, or how much to add. 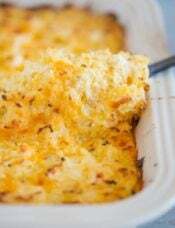 I have made this recipe numerous times and it always comes out perfectly. It was so good that my 11 year old has asked for it for her birthday! I have made it with all kinds of berries, but raspberries are crucial. 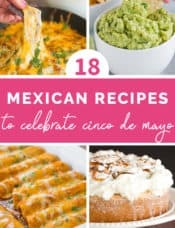 Excellent recipe!!! this looks relish! would i be able to make this into 6 inch mini tarts? and if so, approx how many would it make? Hi Karin, You definitely could! I’m not totally sure how many it would make, but I’m guessing around 3 of the mini tartlets if they’re 6 inches in diameter. 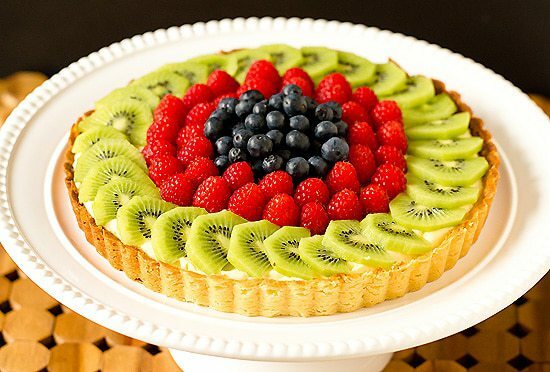 This fruit tart looks stunning Michelle, thank you for sharing. I like to bake up a tart with refreshing grapefruit, blood orange, kumquats, lemon, and lime. I have been making this pastry cream recipe (delicious!) every year for Easter for about 3-4 years. It sets up great, but once I assemble the tart (maybe 30 min-1hr before serving) and slice it, the pastry cream is always falling out the sides and it all becomes a mess. I can’t figure out what I’m doing wrong since the pastry cream is so thick and creamy as I’m assembling. I top with berries and LIGHTLY glaze just before serving. Any tips? Ideas why this keeps happening? Any help would be so appreciated! Hi Shannon, Hmmm if it’s super thick when you assemble, I’m not sure why it would get so runny so quickly. Do you keep it refrigerated until you serve? Perhaps try letting it cook just a SMIDGE longer? This tart is delicious, and so stunning!! 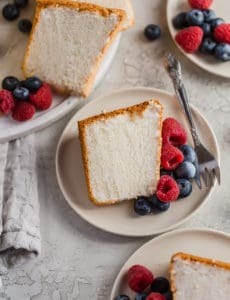 Perfect dessert for a summer BBQ. I pre-assembled all the components the day before serving so putting it together the next day was easy. Highly recommend!! I’m in the midst of making this delicious-looking tart, but my cream is very runny and thin even though I’ve let it set for 3+ hours. Is it too late to cook the cream more? This is my first time making pastry cream but if you have any suggestions that would be fantastic! Hi Isabella, The pastry cream should noticeably thicken before you even take it off of the stove, with huge bubbles bursting. If this did not happen, it probably was not cooked long enough. I don’t think you could put it back on the stove after a long chill, I would recommend starting from scratch. 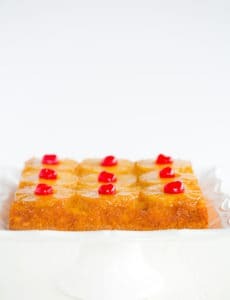 Would it be okay to use pastry cream that has has been in the fridge for 3 days or is it better to just make fresh pastry cream at that point? Hi Grace, I think that would be okay, as long as you plan on eating the tart within a day or two, at the most. I have made this for guests arriving any minute and it will not set! I am fearful that I will not have a dessert tonight. The crust is fine but the filling is off. My FIRST and ALL TIME FAVORITE recipe of BEB!!! I made miniature versions and they were such a hit that I am officially the fruit tart queen at every gathering/reunion/party ha.